Just last year our customer Andrew received $3,000 from Rheem toward the cost of tools and supplies to support his studies, freeing up his apprentice wage to support a busy household of five and fund a well-deserved family holiday. Andrew was a second-year apprentice plumber studying at the Canberra Institute of Technology’s trade centre at the time of winning the grant. He’d heard about the award before, but it was one of our Fyshwick trade sales consultants and his boss, Tom Martin, who encouraged Andrew to apply. And he’s sure stoked he did! Andrew used $2,000 of the grant towards the cost of purchasing power tools and $1,000 towards plumbing supplies, at Southern Plumbing Plus, kick-starting his new career. “I nominated Southern Plumbing as my preferred plumbing supplier as they’ve got plenty of gear on hand and are always happy to help out,” says Andrew. Before starting his apprenticeship, Andrew was a greenskeeper working predominantly with irrigation systems on golf courses which flooded his interest in plumbing. “Starting an apprenticeship with three kids and having to support the family on an apprentice wage was tough, but the Rheem grant helped me out a lot with buying tools, an expense I no longer had to worry about,” says Andrew. Andrew even got his 15 minutes of fame being featured on WIN News last year. You can view his story here. Watch how Andrew’s Rheem grant helped him. 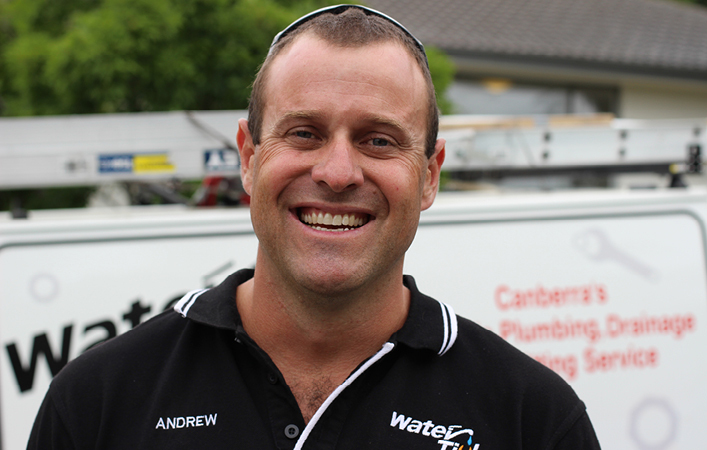 Tom Martin, the founder and owner of Water Tight Canberra, said that since employing Andrew as a mature-aged apprentice the company’s philosophy has changed with them now taking on more mature-aged apprentices than juniors. “You're employing someone with a lot more life experience, who have considered their future and chosen their direction,” says Tom. As an employer, Tom saw firsthand how the Rheem grant benefited Andrew and his family. “Andrew has always put his trade first ensuring he has all of the appropriate tools throughout his apprenticeship despite the limiting capacity of an apprentice wage. Winning the Rheem grant allowed Andrew to take his family on a well-deserved vacation,” shares Tom. “I definitely recommend all apprentices applying for a grant. For the easy 10 minutes it takes to complete the form the rewards are significant if you’re a lucky recipient,” says Andrew.